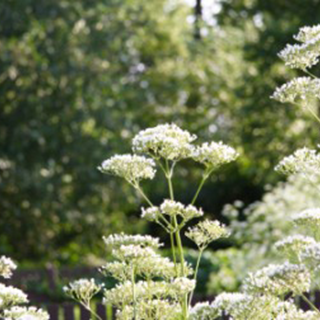 One of the most popular of all Chinese herbs, Dong Quai, also known as Chinese angelica is regarded as the main women’s tonic, helping to support a regular menstrual cycle and easing menstrual pain. As a warming and relaxing remedy that strengthens digestive and liver activity, it is suitable for both men and women. Dong Quai tonifies, detoxifies and nourishes the blood, while it improves peripheral circulation. The herb regulates menstrual periods and relaxes menstrual cramps, helps arrest uterine bleeding , and is a gentle laxative for treating chronic constipation. 1:3 tincture, 2–4 ml a day, or max. 30 ml (1 oz) per week to increase vitality and libido, treat infertility, regulate periods, and for anemia due to blood loss. Seed is best sown in a cold frame as soon as it is ripe since the seed only has a short viability. Seed can also be sown in the spring, though germination rates will be lower. It requires light for germination. When large enough to handle, prick the seedlings out into individual pots and grow them on in a cold frame for their first winter, planting them out into their permanent positions in the spring. When the dong quai root is one year old the root is harvested, peeled and dried in the shade.